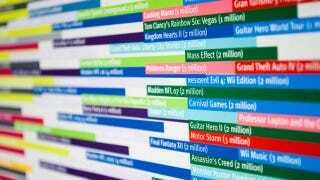 Graphic designer Eileen Lopez has put together this very helpful chart, which shows the best-selling games of all time in the United States. All of them. From the 2600 to the 360, Space Battle to Smash Bros.
A few things to note before we continue! Firstly, to keep things clean, Lopez rounded off the sales figures so they'd fit the scale of the infographic. Secondly, games had to sell over one million copies to make the cut. And thirdly, things might get a little busy towards the more recent years as more and more games sell more and more copies, so you can see the full image (at 4000x2200, which she's kindly donated to Kotaku) here. Oh, and if you see a series in the last ten years that doesn't look it has the sales to be on there? Those are her favourites! You make your own version, you can add your own too. For some classier shots of the thing, you can check out Eileen's site at the link below.